It is that time again. It is Restaurant week. 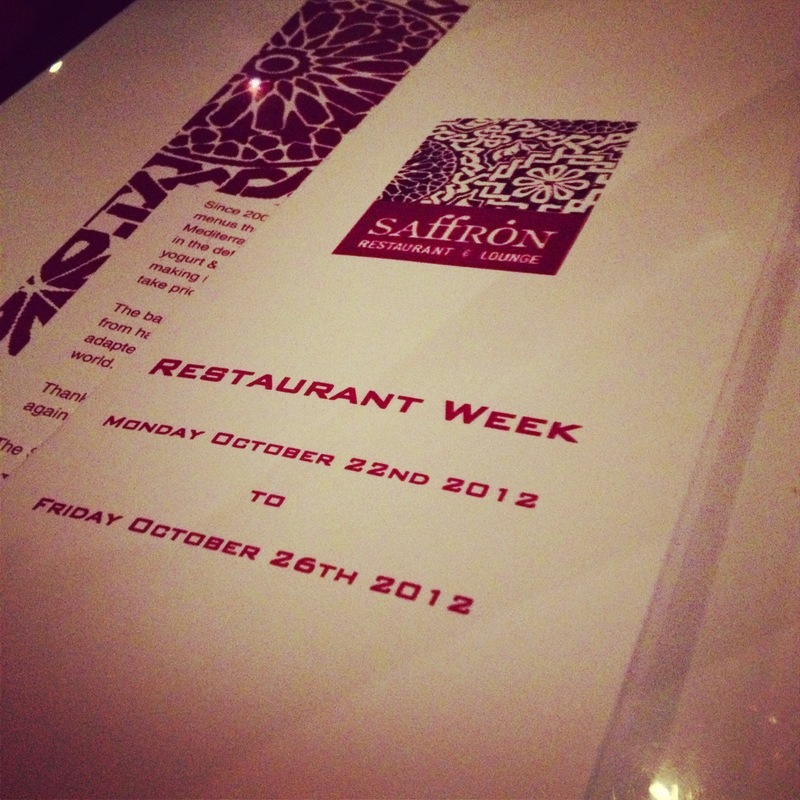 My pick for Fall Restaurant Week 2012 was Saffron. I picked Saffron because of the menu. They had starters that sounded fresh, entrees that were adventurous (more so than the steak, chicken, and fish options), and dessert that sounded delectable. I also liked the option of the add on wine pairing and the suppliments. 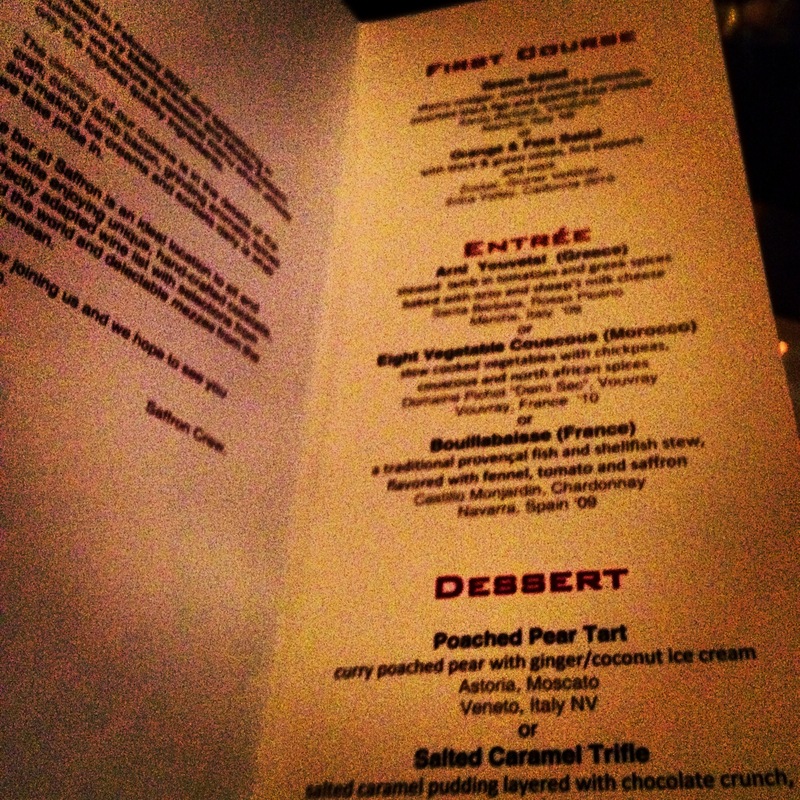 I would suggest the wine pairing because it is worth the cost and the tables around me all ordered it. I am glad that I chose Saffron because I had never been there before and it was an excellent meal. 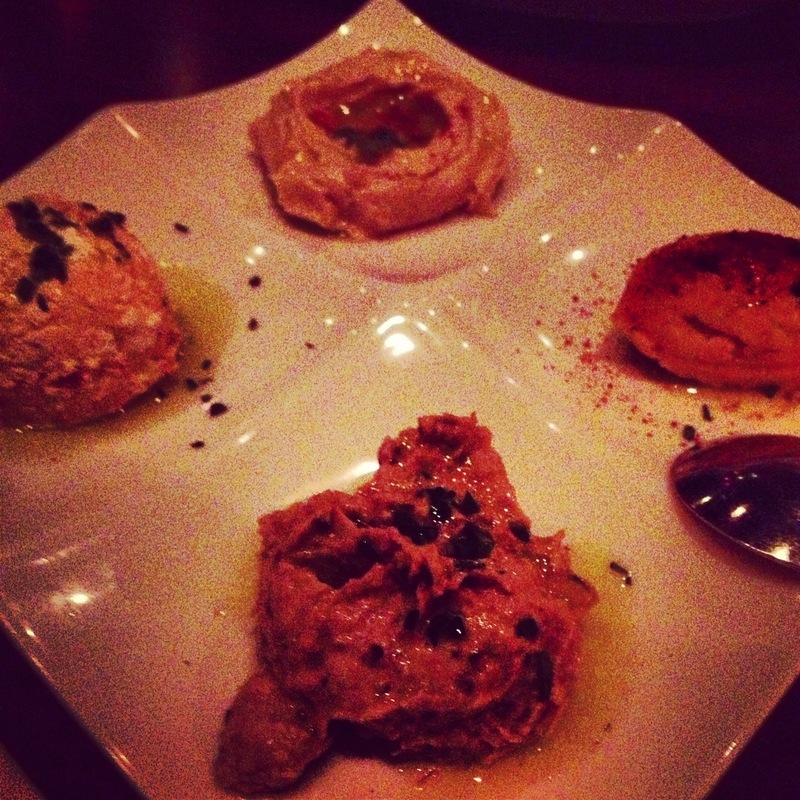 Saffron serves contemporary mediterranean and middle eastern cuisine. Every dish is full of spices and made with quality ingredients. The night started out with a bit of a mess. Saffron is not the easiest place to get to. We pulled into the parking lot that was closest to Saffron and it was 10 dollars to park there with no valet. Holy Crap. So, my first bit of advice is to take public transportation there. That made me a bit cranky, but when I walked into Saffron I was quickly greeted and seated. The atmosphere of Saffron is romantic, dimly lit (as you can tell by my pictures) and plush. This restaurant has a calming nature to it. None of the servers were rushing around and they let you take your time. The first course was the salad course. I had both selections on the restaurant week menu; the blood orange salad, and the greens salad with figs and blue cheese. Both were very different and good. The blood orange salad was fresh and bright. 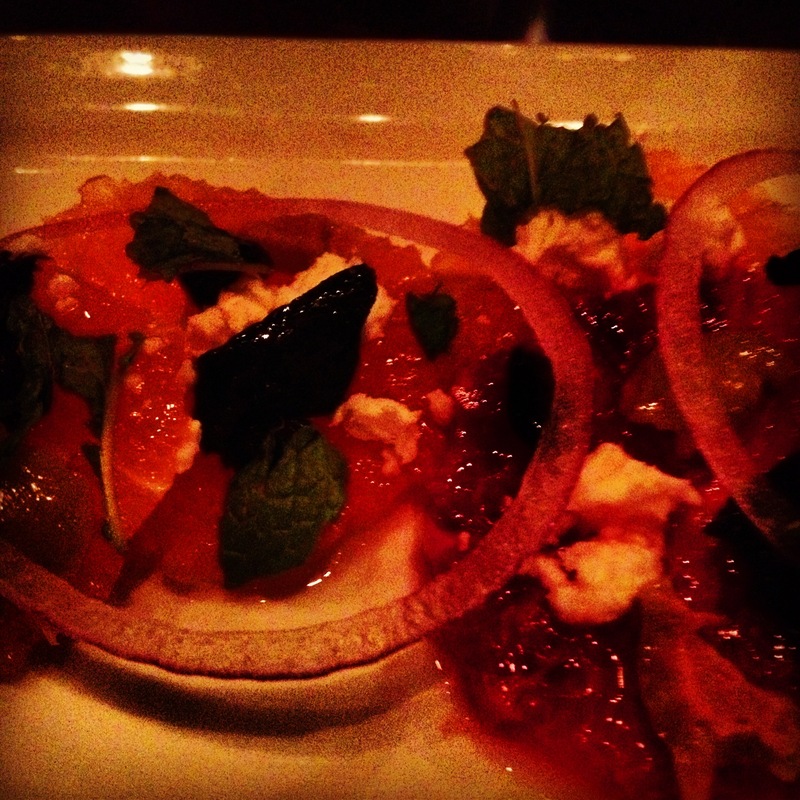 I liked the salty feta with the sweet orange and then the bite that comes with the olive. I almost thought it was going to be too summery but suprisingly the olives added a deeper tone. It was a really great start to the meal. 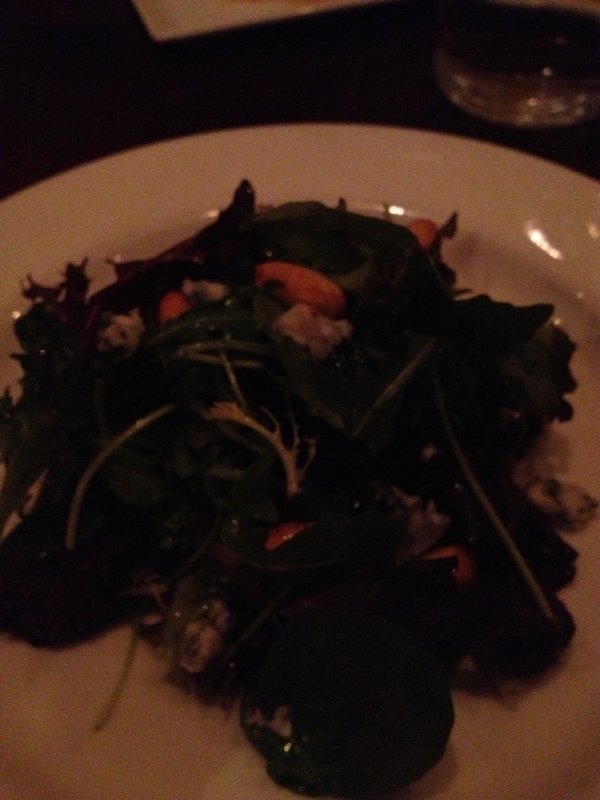 The green salad was also fresh and had spiced almonds on it. Whatever those almonds had on it, I wanted a plate of them. It was dressed perfectly and had blue cheese and figs. As a supplement I had the additional plate of assorted traditional spreads. Supplements are add ons that can be purchased for 10 extra dollars, I would suggest getting this. My favorites included hummus and the spicy goat cheese. But, do not discount the other spreads such as the baba ganoush which was smokey and deep and the lentil spread with spices. Then came the entrees of Arni Youvetsi (lamb) and Bouillabaisse. They were full size. The lamb dish was heavy and savory. 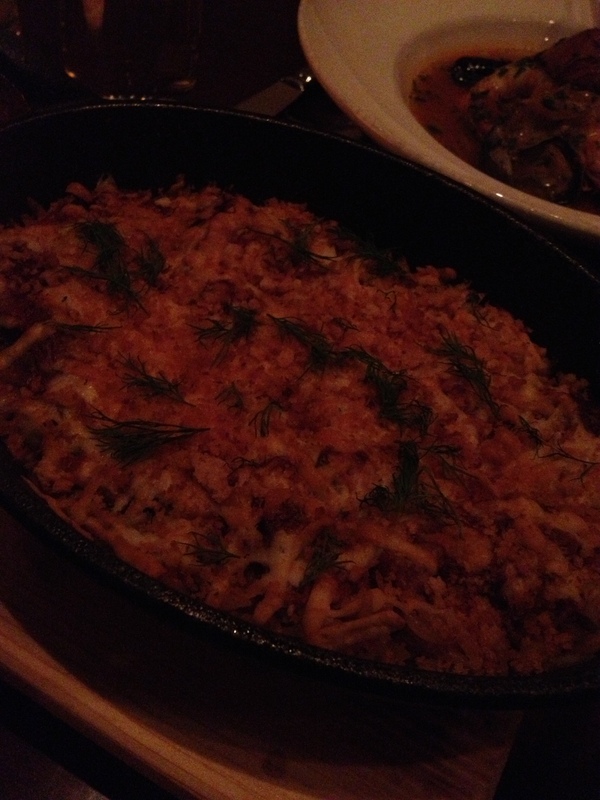 It was spiced and was served with orzo and reminded me of a fancy Minnesota hot dish. It was a little salty for me but I believe it was because of the combination of the bread crumbs and the cheese that was over salted. 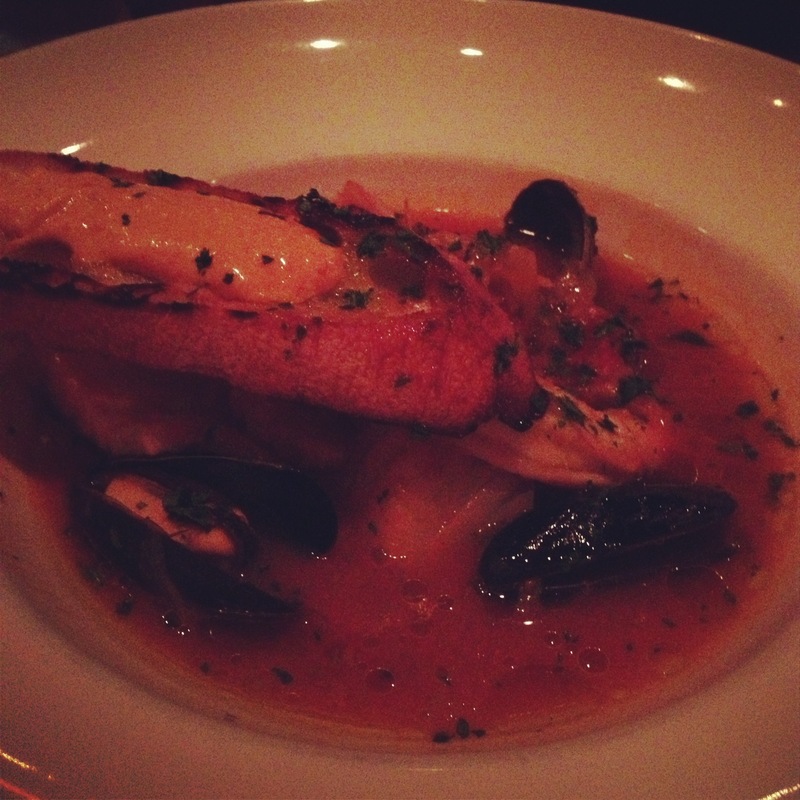 The Bouillabaisse was excellent and had the taste of the sea. I was impressed by the ingredients that were used in the dish; Harissa shrimp, clams, mussels, and a few types of fish. They also added a toasted piece of bread with a sauce on it which was excellent when dipped in the broth. 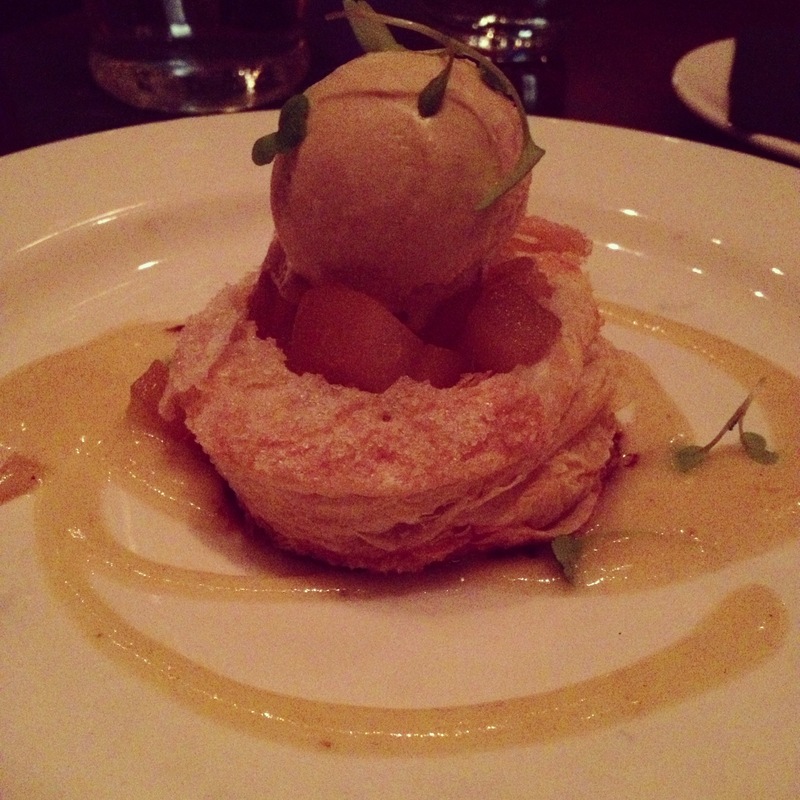 The only low point of the meal came during dessert when the pear tart came. Although, this picture makes it look beautiful, it had clearly been made awhile beforehand and sat in a fridge until served. This caused the pastry part of the dessert to be hard and stale. The pear could have used a bit more spice. I liked the ice cream that topped it and the sauce on the plate but it couldn’t make up for the hard pastry. The other dessert was great. It was a salted caramel trifle. It was rich and creamy. It was cold and had a crunch to it with the cookie on the bottom and the brittle on top. It was the highlight of the meal. Even when I was full, I kept eating this. 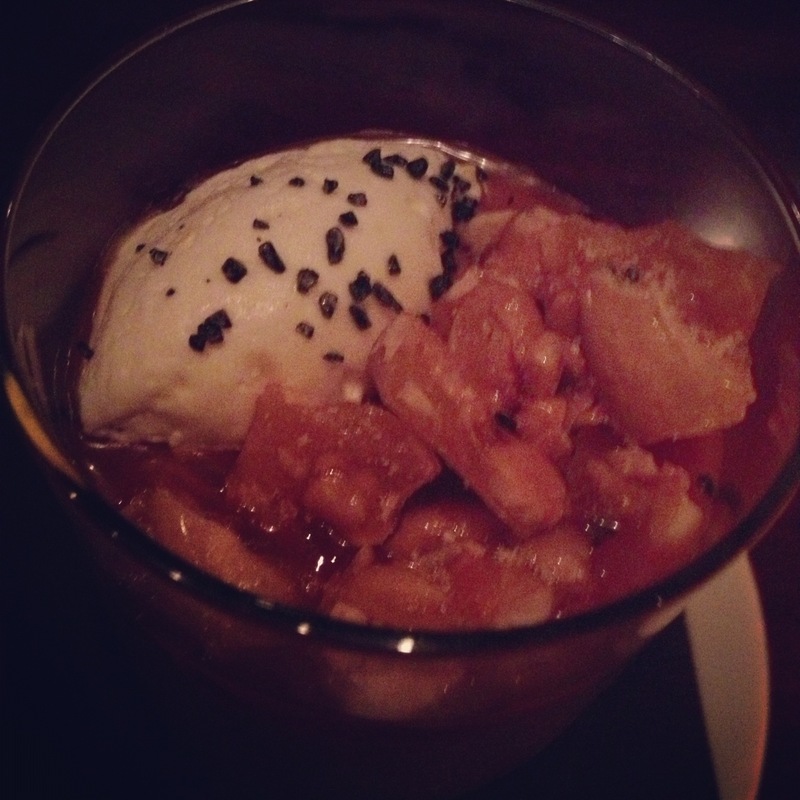 My suggestion for next restaurant week is that the chef does a trio of trifles. I would love to see what kinds Saffron would come up with. The service at Saffron was great. I appreciated the calmness of the staff and the quiet of this restaurant. If you have not made reservations yet, try Saffron. It was delicious. I would order either salad, the suppliment of spreads, the lamb entree, and the trifle for dessert. You can read my eariler post about how to participate in restaurant week HERE and see my picks for fall restaurant week 2012 HERE. because I love good food. disclosure: I have not been paid to provide endorsement for either the restaurant or promoters of restaurant week. These opinions are my own and I did not receive any compensation for posting them.